The post is also available here. If one part of an event is a lie, the whole event is contrived. 2:19 p.m.: An Uber driver dropped off Nikolas Cruz, 19, at the high school. 2:21 p.m.: Cruz entered Building 12, armed with an AR-15 style semi-automatic rifle and several magazines. He activated a fire alarm and began shooting indiscriminately at students and teachers, killing 17 and wounding another 17. The shooting lasted 6 minutes. 2:28 p.m.: Cruz got out and ran in the direction of tennis courts before going south, according to the sheriff’s office. At 2:29 p.m., he crossed a field and ran west, blending in with fleeing students. He walked to a Walmart, where he purchased a soda, then to a McDonald’s, from which he departed on foot at 3:01 p.m.
At about 3:40 p.m., Cruz was stopped by police 2 miles from the school and arrested without incident. In a CBS interview with David Hogg, the reporter made clear Hogg was in the school when the shooting began. He hid in a closet, from which he reported live on the shooting, as well as interviewed other students. Below is a screenshot of the CBS News video. Note the words at the bottom of the screen: “STUDENT INTERVIEWED CLASSMATES AS SHOTS RANG OUT”. 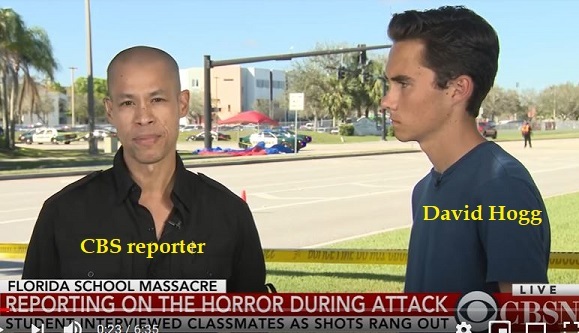 The video then cuts away from the girl, still talking, to the CBS reporter resuming his interview with David Hogg. Who was the girl? And what more did she say? The video below is the rest of the story that CBS did not air. Recall that when Hogg, hiding in the closet, began reporting live on the shooting, he said “It’s 2:52.” But according to the timeline of the shooting, it was over by 2:28 p.m.
How did Hogg go from being in the closet at 2:52 p.m. to interviewing Alex Vieux at 9:32 p.m. — all while the shooting was going on? That makes no sense. Why would Hogg and Vieux still be hiding in the closet at 9:32 p.m., long after the shooting had ended and the shooter arrested? Or was it actually 9:32 a.m. on February 14, 2018, which would be nearly 5 hours before Nikolaus Cruz started shooting? That makes no sense either. Why would Hogg interview Vieux in a closet about a shooting that hadn’t yet occurred? The only way that one can make sense of the two discrepancies — (1) Hogg reporting on a live shooting at 2:52 p.m., 24 minutes after the shooting had stopped; and (2) Hogg interviewing Vieux at 9:32 p.m. — is that Hogg’s dramatic video footage in the closet actually took place on the morning of February 14, hours before Cruz allegedly entered Building 12 and shot 17 people dead. As a matter of fact, there was a fire drill earlier that day in M.S. Douglas High School! Jim Gard has been a math teacher for 36 years…. It wasn’t another fire drill, or even a fire. It was far, far worse. Authorities said Nikolas Cruz, a 19-year-old man who’d recently been expelled from the school, had returned to campus and opened fire with an AR-15 semi-automatic rifle. The above video is a segment from the CBS News documentary, “39 Days“. Maybe the answer is that David Hogg wasn’t/isn’t a student at M. S. Douglas High School. 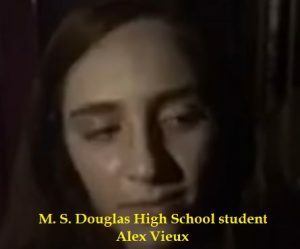 What about Hogg’s interviewee, Alex Vieux? This footage then oddly aired after the “live” Parkland incident that afternoon. To make matters more confusing, the individual goes by “Alex Vieux” in the morning, and “Isabelle Robinson” hours later as the same footage is widely broadcast in the aftermath of the event…. 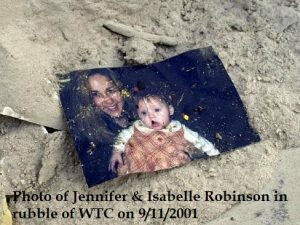 There is another Isabelle Robinson, the daughter of a 9/11 survivor Jennifer Rothschild Robinson. A heart-wrenching story, published in News.com.au on August 21, 2016, describes Australian photographer Nathan Edwards’ 15-year search for the woman and baby whose photograph he found in the rubble of the collapsed World Trade Center. Jennifer Rothschild Robinson’s office at Ohrenstein & Brown was on the 86th floor of the North Tower. Luckily, she didn’t go to work that fateful day, September 11, 2001. 15 years later, photographer Nathan Edwards finally met the woman and baby in the photo. 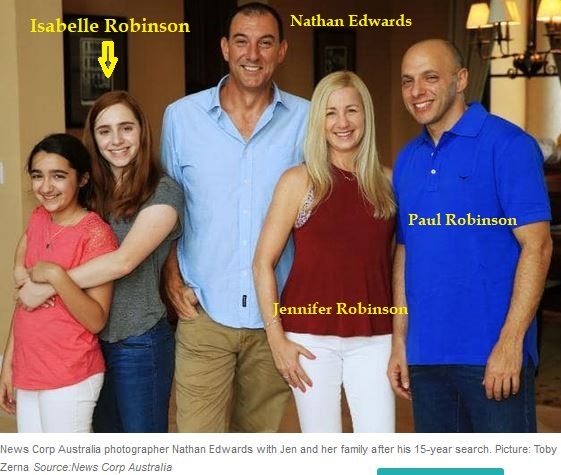 The baby, now 16, is named Isabelle Robinson. Below is a picture of Edwards’ happy reunion with Jennifer and her family in their home in Florida. 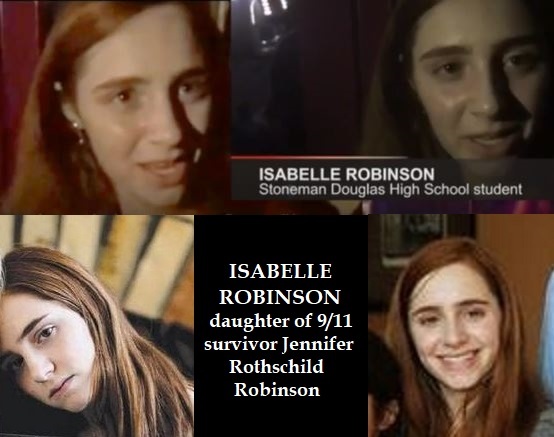 Doesn’t Isabelle Robinson, 16, look familiar? Let’s compare Isabelle Robinson/Alex Vieux with Isabelle Robinson, daughter of 9/11 survivor Jennifer Rothschild Robinson. If they’re the same person, Parkland Isabelle would be a 2-year older version of 9/11 Isabelle. They sure look like the same person to me! According to TruthFinder, Jennifer R. Robinson, 52, lives in Parkland, Florida. Her family members include husband Paul Robinson, 51; William Oliver Rothschild, 90; Elaine H. Rothschild, 86; William Edward Rothschild, 84; Ralph F. Rothschild, 74; and Andrew Bruce Rothschild, 55 — all of Parkland, Florida. What a coinkidink! 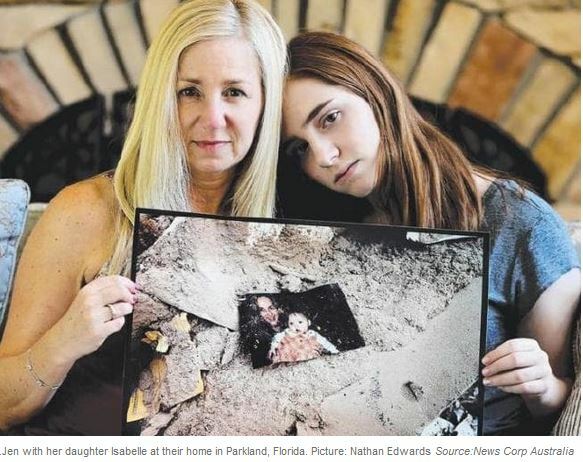 — A baby who survived 9/11 grew up to be a student who survived the school shooting in Parkland, Florida! A big h/t to Tony Mead.